To keep up the appearance of your paviours periodic cleaning may be required. A stiff brush and clean water should suffice. If there is a slight stain a mild detergent such as washing up liquid may be used. Where there are trees is is advisable to sweep the area regulary as they may stain if left for long periods. Power washing is not usually needed but if desired it is best to sweep the area well as debris could scratch the surface. Proprietary cleaning agents should only be used with care as they might effect the colour over time. Always read their instructions before using. Efflorescence can appear as a milky white stain which may occur on the surface of the product which can give the appearance of loss of intensity of colour in material. It is not detrimental in any way and is temporary. We cannot accept responsibility for it’s occurrence. The colours in this brochure are as close photographically as possible, but we would recommend that you view a display before making your choice. Colour change can occur due to the natural raw materials being of slightly different shades. 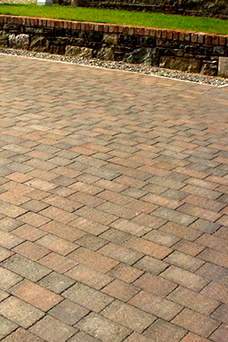 We advise that all the paviours are chosen from the same batch and that you select your paviours vertically from two different pallets for the best effect.